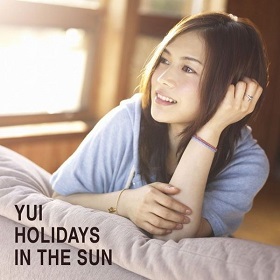 Holidays in the Sun is 4th studio album of YUI. The album is her first to be released after her hiatus at the end of 2008, and it contains five Oricon #1 singles : to Mother, again, Gloria, Summer Song, and It's All too Much. This became her fourth straight album to top the Oricon charts, eventually selling over 300,000 copies and attaining the certification of Platinum by RIAJ ((Recording Industry Association of Japan). With this album, YUI held her fourth tour in 2010 with the name Hotel Holidays in the Sun (September 12 – November 2, 2010). This album contain one self-cover song : I do it. This song originaly written for Stereopony during YUI's hiatus. This album released in two version : Regular Edition with 13 tracks on CD and Limited Edition with CD plus DVD containing 6 music videos.